A few years ago when I first moved to Canada, I went shopping for a television with my dad. There were many options and I can not exactly remember what my dad was wanting to get, but we ended up buying a television that had 3D. It came with all of the Shrek movies and all of them could be watched in 3D. It also came with a couple of 3D glasses. We thought it was pretty cool, but we only watched the first Shrek movie in 3D and then promptly forgot about the whole thing. It was such a niche feature on a television when most people just want good regular display quality. At least the screen had excellent quality other than 3D, otherwise it would have been quite a waste. It seems as if it is becoming increasingly more common to find a normal product, like a television, with some sort of added twist to it, even though no one really cares about 3D nowadays. The twist is usually a little niche, but it can also be very good. I remember that for a while, Razer had those keyboards with a small touch screen to the side for some added functions. Apple has something similar with some of the newer MacBooks featuring a touch bar along the top of the keyboard. One of the best mice I have ever owned is the SteelSeries Sensei. It had a small niche extra feature as well, which was a screen on the bottom of the mouse. I personally never used it as I never really understood what I should put there. 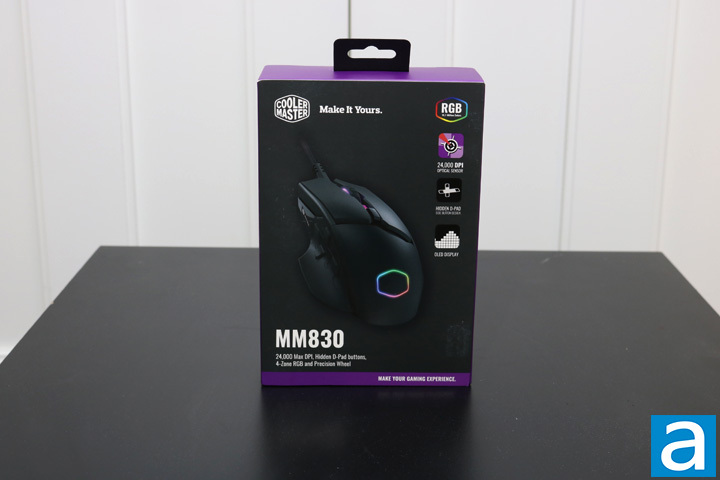 Today, we have the Cooler Master MM830, which features an OLED screen on the side. Will it be one of those niche features with no real use, or will it be useful? Read on to find out! We received quite a few Cooler Master products that will be up for review in the coming weeks. Among them of course was the MM830 we are reviewing today. The package was shipped via FedEx Ground and arrived in fairly good condition to us here in Calgary, Alberta. One of the corners, as you can see in the above picture, was a bit more beat up than the others, but not enough to cause alarm. The rest of the box fared much better. There were only small dents around, while the edges took some more damage than the rest of the box. None of this is unusual and so there was no reason to be alarmed. Cooler Master took the required steps to ensure everything arrived safely. After inspecting the outside, I proceeded to have a look at everything that arrived. As with all the new Cooler Master products, we find the classic black background with the purple accents; a nice clean and minimalist look. The name of the product is found in bold white font in the bottom left of the retail box, while a few standout features is listed right below the name in the same white color, only slightly smaller. 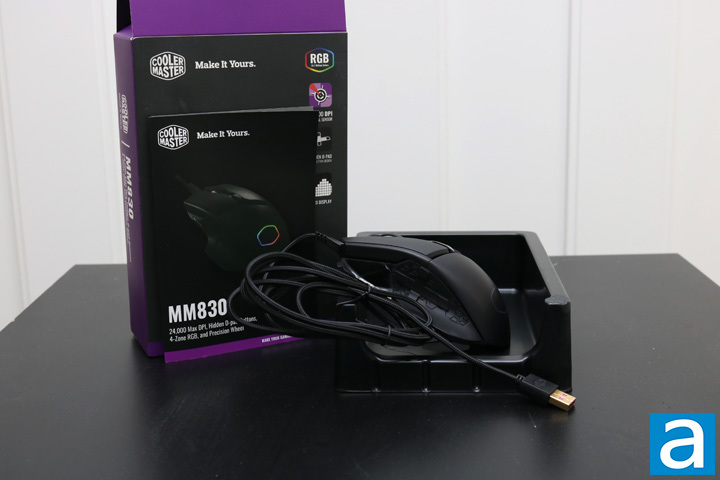 A large image of the Cooler Master MM830 is found on the front with the Cooler Master logo illuminated in RGB colors. Along the top right of the box, we find a couple more standout features of the MM830, namely the RGB, 24,000 DPI sensor, hidden D-pad, and the OLED display. All of these are pretty cool and will be detailed later in the review. The rest of the retail packaging is fairly standard. On the one side and the back, there is more information listed in many different languages. As usual with many mouse retail packaging, the front can also be opened to show the mouse behind some plastic. The inside of the box of the Cooler Master MM830 is quite standard. There is one large black plastic mold, which the mouse rests on. A large clear plastic mold is then placed over the mouse to keep everything in place. The cabling and the information booklets are found behind these molds. The cable is tucked nicely away behind the mouse to ensure the front looks nice and clean. The contents are quite basic, but keep the product safe during transportation. The small booklet included explains some more specifications and some basic functionality using a combination of buttons on the mouse. Specifications are also listed in detail, while the two-year warranty is explained on the back of the booklet. Overall, the retail packaging is what is expected and kept the mouse safe.